Saturday, November 2 is All Souls Day and Dia de los Muertos. Imagine setting out a picnic near the graves of your ancestors. While anathema to citizens of the twenty-first century, to those living in the nineteenth a site like Rock Creek Church Yard and Cemetery beckoned both as a refuge from city life and a bucolic setting where deceased loved ones could be remembered with al fresco repasts and restful strolls. First established in 1719 at St. Paul’s Episcopal Church, Rock Creek Cemetery was eventually expanded, landscaped following the aesthetic of the Rural Cemetery Movement, and opened to the public as a burial ground and park. Its natural rolling landscape and winding pathways beneath groves of trees make it one of the city’s most inviting spots. It is also one of the most historic, final resting place to prominent citizens of the District of Columbia. Brewer and philanthropist Christian Heurich is buried in an ornate mausoleum. You will also encounter department store magnate Levi Leiter, writer Gore Vidal, and the indispensable Alice Roosevelt Longworth. The grave of the District official who lined the city’s streets with trees, Alexander Robey Shepherd, rises beneath specimens planted during his lifetime. 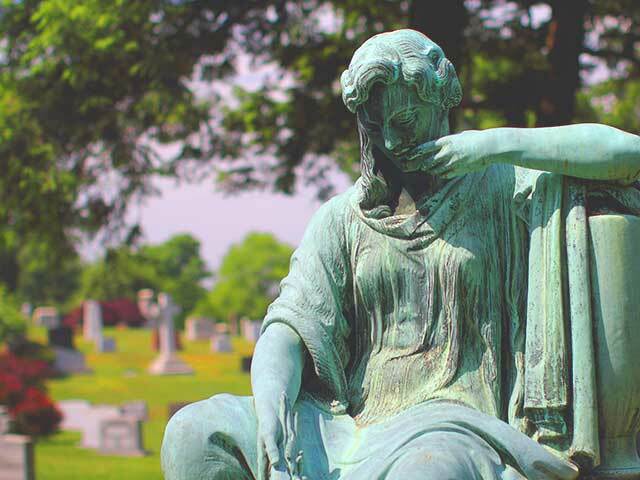 Artful tombstones and breathtaking sculpture are abundant, most notable the evocative memorial to Henry and Marian Adams designed by August Saint-Gaudens. It alone is worth the visit.